Pakistan's army chief says a recent memo that accused the military of plotting to overthrow the president was an attempt to lower the military's morale. In a statement filed with Pakistan's supreme court, General Ashfaq Kayani said the memo had "impacted national security." He called on the court to fully investigate the circumstances surrounding the memo's origins and who wrote it. General Kayani, and Pakistani intelligence chief Ahmed Shuja Pasha both say they accept evidence provided by Pakistani-American businessman Mansoor Ijaz, who has accused former Ambassador Hussain Haqqani of writing the unsigned memo. 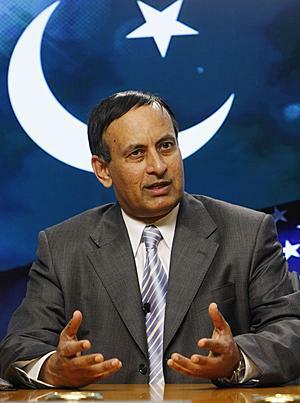 Haqqani has denied any connection with the memo, but the scandal led to his resignation last month as Pakistan's ambassador the United States. In October, Ijaz wrote a newspaper column accusing Haqqani of writing the memo, which requests U.S. assistance to prevent a military coup. The letter was reportedly sent in May to Admiral Mike Mullen, the top U.S. military official at the time. On Monday the supreme court is scheduled resume a hearing on a petition filed by an opposition leader (Nawaz Sharif) demanding an investigation into the affair. The memo, which has generated enormous controversy in Pakistan, asked for U.S. help to prevent a coup, in return for which a new national security team would conduct a full inquiry into allegations that Pakistan harbored al-Qaida leader Osama bin Laden. The new team also would hand over top al-Qaida members and ensure that Pakistan's military spy agency cuts ties to the Taliban, the Haqqani terrorist network and other groups. U.S. military officials have said Admiral Mullen received the memo, but did not find it credible. Rumors have also been swirling that, under pressure from the so-called "Memogate" scandal, President Asif Ali Zardari was planning to resign. The 56-year old Pakistani leader traveled to the United Arab Emirates earlier this month for treatment after falling ill. Doctors said when Zardari was admitted, he suffered from numbness in the arm, twitching, and a loss of consciousness for a few seconds. Prime Minister Yousuf Raza Gilani denied reports that Zardari suffered a stroke or offered to step down from his post.